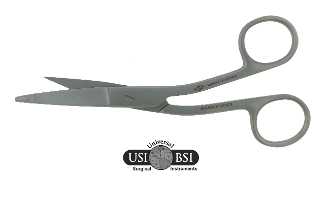 USI Super Cut Hi-Level Bandage Scissors are primarily used for removing tight bandages. The tip of the lower blade features a flattened blunt nodule that is intended to slide between bandages and skin without harming the skin. We specfically designed the top blade to be narrow unlike the thick upper blade of regular bandage scissors, this helps to get into those extra tight spots. Every doc and tech that gets a pair of these will say they are well worth it!